Mueller, sitting on a dais with a group of eight men and one woman, said VW “must become more international, more entrepreneurial and more female -- especially at the management level." WOLFSBURG -- Volkswagen Group is "is back on track" even as it works through its global diesel scandal, CEO Matthias Mueller said. Speaking at the automaker’s annual press conference here, Mueller said that despite its global diesel crisis, “2016 did not turn out to be the nightmare that many predicted” for VW. 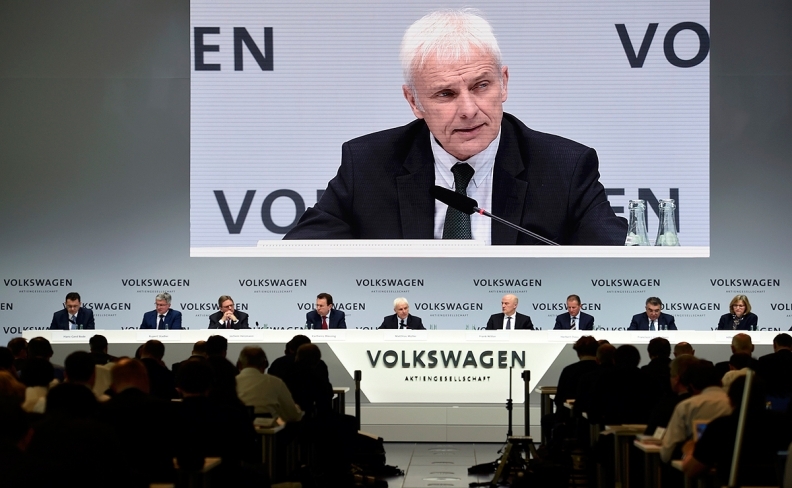 To move forward, though, VW “must become more international, more entrepreneurial and more female -- especially at the management level,” he said. On Friday, VW pleaded guilty to three felonies in a U.S. District Court in Detroit. In court, U.S. prosecutors credited the company for cooperating with its investigation, including providing information to U.S. authorities “in real time” from the company’s internal investigation. Mueller said working through the diesel crisis continues to be the company’s top priority. He said VW globally was modifying about 200,000 customer vehicles per week, and had now modified 4 million vehicles worldwide, including 1.5 million in Germany. Mueller said the company’s goal is to complete modifications for the diesel scandal by this fall. During questioning from reporters, Mueller said VW supports global free trade, and will continue to operate under free-trade deals in effect, such as the North American Free Trade Agreement. “We support free trade and open markets. This is really necessary. VW plans to harmonize rules around the world. In a global market, it doesn’t make sense for each market to have its own rules and regulations,” the CEO said. But Mueller, in a later discussion with reporters, sent mixed signals by not ruling out the possibility of talks with FCA. "I am not ruling out a conversation," Mueller told journalists after VW's annual results news conference. "It would be very helpful if Mr. Marchionne were to communicate his considerations to me too and not just to you," Mueller said, speaking in German. Mueller declined to discuss whether the recently announced PSA-Opel deal could reinforce consolidation among carmakers in Europe and said VW would in any case press on with its strategic shift to embrace electric cars and automated driving. "I am pretty confident about the future of Volkswagen, with or without Marchionne," he said. Mueller was called out over the company’s new efforts to expand the number of women in management. Around the world, VW said it employed 113,928 men in 2016, and just 19,316 women, or 14.5 percent of its total. In terms of future products, Mueller said the automaker remains committed to its post-scandal electrification and mobility strategy, despite how slowly electric vehicles sell in relation to those powered by gasoline and diesel engines. Mueller said VW will continue to pursue advances in internal combustion engine technologies, even as it pursues further development of EVs.